Mix together Protein, Oats, Peanut Butter and Honey. If needed add more honey or protein to make a ball that sticks together but not sticky. Knead into the bottom of 11x7 pan. Spread a layer of Choc. Chips and place for a few seconds under the broiler. Spread softened chocolate over bars and refrigerate just till set, then slice into bars and return to refrigerator till chilled completely. This is our HEALTHY version of Reeses Peanut Butter Cups! 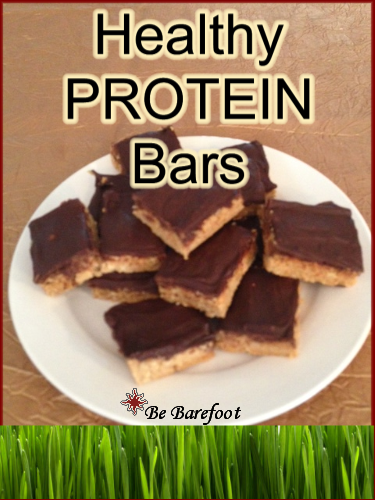 If you struggle with cravings and blood sugar spikes these protein bars are a must to try. They are a quick, simple snack and when taken with a large glass of ice water with a couple of fresh lemon slices, will be sure to keep you on and even keel as you go about your day.